Anybody Know What Windows 1993 Is? Hello. 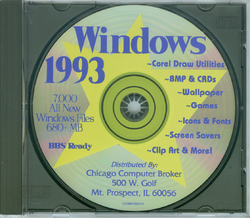 I'm wondering if anybody knows what this CD called Windows 1993 Is? I'm not sure if its an operating system or something else. I also know a relative that has a physical copy of this cd if you want a better look at it. If you know what this is please tell me. Last edited by JohnsterSpaceNT on Wed Apr 10, 2019 3:59 pm, edited 1 time in total. Alright then, would it be acceptable to upload the physical copy I have to FTP or not? Maybe. The final decision lies the hands of the site admins. You might PM them. Well, it looks pretty simple, it's one of those public domain discs filled with exactly what it says: screensavers, desktop pics, cliparts, icons, "games" and whatnot... nothing Microsoft and no OS on it. I've seen tons of these and they are all the same . Nothing we would archive, but if you want to share it in public go ahead. I have already noticed this disc from Archive.org, and it is a shovelware CD. It has a bunch of freeware junk on it, nothing very useful to BA and something that can easily be found online. Windows 1993 refers to Win 3.11, it was a common expression for it. The cd in the OP is shareware, in the usual pre-internet distribution thereof. The better ones were things like from Walnut Creek (Cica), and the like.